I guess you can tell I’m excited about the truckers, lol. I feel hope I hadn’t felt for awhile. I felt the hope with bikers too. The Louisiana truckers have started a Facebook page: Louisiana Truckers to shut down. If your on Facebook give them a like and wish them luck. A God bless America would help too. I haven’t found any pages on Facebook of other state truckers but is a little early who knows. If you are on twitter their at hashtag #T2SDA, go talk with them and let them know you support them. Facebook has made some truckers mad. You can read about it at:The Fight is On!! Facebook Gestapo Strikes Again! and Facebook Page Has Been Taken Down! If your wondering why Canadian truckers join our truckers, Canada has truckers that deliver here. What affects us affects them too. Yes, they do have other reasons too. Pray for them too. Did I mention they plan to shut down Toronto? Keep spreading the word about the truckers. Pray for them too. They just don’t need our support but God’s support, protection and blessing. We’re also going to need miracles in this. Only God can provide it. 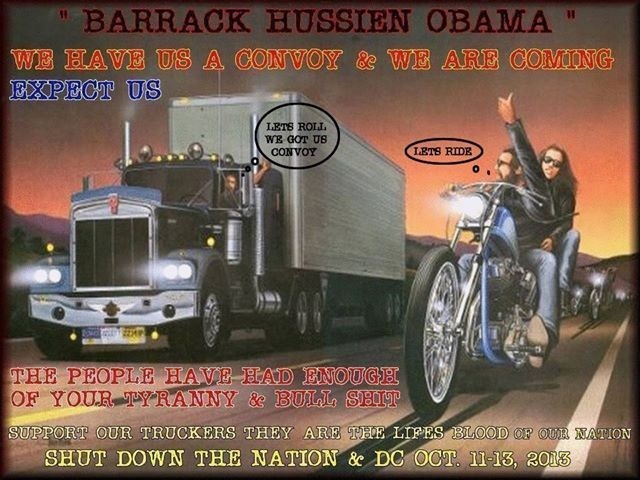 This doesn’t have anything to do about the shut down but it is about a trucker. It is lovely. You can read it at: The American Trucker, An Endangered Species by The Bunker. It is under the title “An Endangered Species (Guest Commentary)” at Ol’ Boards site. I just used the original title of the Bunker.